Hello PlayStation! My name is Matthew Steinke, and I’m so excited to bring you this very special look at our upcoming Blood and Wine expansion, which launches today. 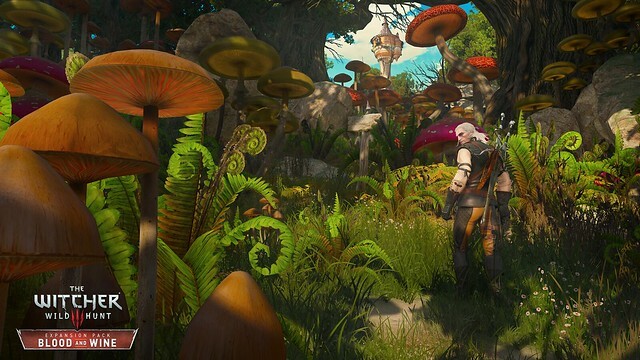 When we set out to design an entirely new region of The Witcher’s vast living world, we wanted to take you on an fantastic journey far beyond the war-ravaged villages of No Man’s Land and stormy beachfronts of the Skellige islands. Taken directly from the pages of The Witcher fantasy novels, we welcome you to the Nilfgaardian realm of Toussaint; the enchanting and mysterious Land of Wine. Heavily inspired by the beauty and pageantry of the French/Italian countryside, Beauclair, the region’s capital, blends rolling hills, winding roads, charming villas and intriguing characters to create a colorful and vibrant landscape unlike anything you’ve seen in Hearts of Stone. This change in contrast, from our traditional Slavic mythos of The Wild Hunt to a world of fairytales gone wrong, opened a world of possibilities enabling us to craft a completely fresh adventure full of dark deeds, unexpected twists, romance and deceit. Pouring all of that passion and creativity into over 30 hours of open-world exploration, we’ve packed the world with ancient elven ruins, surreal monsters and legendary places of power, where every point of interest takes you further down the rabbit hole and one step closer to unraveling the horrifying secret behind a strange beast terrorizing the kingdom. 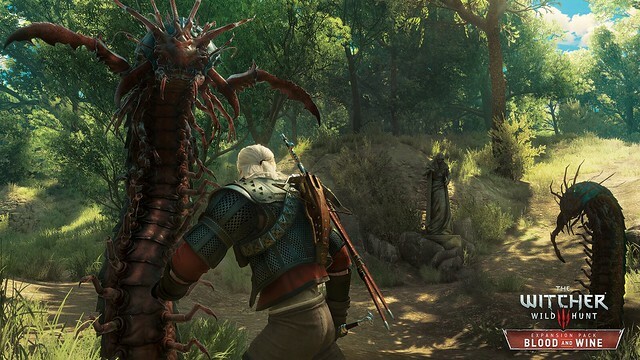 With all trails leading to dead ends, only The Witcher can solve the mystery and survive the evil lurking in the night. Along the way, you can team up with powerful allies, demonstrate your true fighting skill in the Grand Tourney and upgrade your combat abilities with 12 new skill-augmenting Mutations. 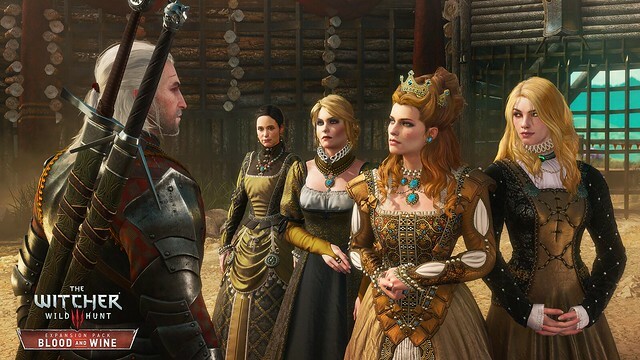 To help prepare Geralt for his final quest, we’ve also added alchemical recipes, crafting schematics, and a new grandmaster level of Witcher armor featuring new looks and improved statistics for each of the existing witcher schools. For the intrepid explorers who enjoy delving even deeper into the world of The Witcher, 13 custom armor dyes can be applied individually to color every piece of the set. For all of the completionists out there, there’s also a set of rare dyes and alchemical dye recipes that can only be acquired by overcoming the most remote and challenging areas of the Toussaint region. Looking back over all of the new features, I’d say this one is my favorite. Unlike an ancestral sword that deals more damage or a piece of relic armor that provides greater resistance to injury, with no impact on player statistics, this feature is all about experimentation, having fun and realizing the story you wish to tell. A decision made based on all of the community feedback we’ve received over the last year, this new game mechanic is a special thanks from all of us here at CD Projekt Red to you, the best fans in the world! I’d be interested to know mine as well, unfortunately I have left the game on either paused or in a game menu over night a couple times and it now reads about 13 days 15 hours of play time haha. Wish they were able to break it down like Uncharted via time in Menus, time in conversation, time standing still, and time playing. I know this is an impossibility, but was just wishful thinking. CD Projekt Red doesn’t need any more work than they already have haha. Oh well, I’m sure I have spent hundreds of hours on this game (and I’m still only in Act III!). Yeah thanks for killing my excitement to play BaW…months waiting with huge hype for BaW just so you guys can kill ma motivation and all ma hype for it.What you did with the menus is unforgivable…I fired up the game yesterday with huge excitement to see the new main menu and all just to load ma save and cry with sadness and disappointment.After seeing all those stupid changes in the inventory and etc…I really wanted to break ma Witcher 3 disc and never play the game again,since 1.07 you guys always ruined something good in the game but this time around you guys went overboard.So much things to fix in the game and you guys go and change what is already great,like always with your unnecessary changes. Had CDPR as the best multiplat devs out there but now I have doubts and I only know 1 thing for sure…that CDPR is the worst devs when it comes to patchs.I had never seen devs who want to ruin their game before. Oh well…I hope y’all are glad to ruin all my eagerness for BaW. PS:Glad I always mark ma hours manually cuz seeing ma hours reset to 5 hours was not a nice sight. It’s “my” not “ma” . Please return to elementary school and begin again before making pointless complaints on an online forum. Thanks in advance! I’m glad someone else found your use of the word ma pathetic. I’m not a big fan of TW3, after act 1 I got bored of it all. I did plus through and finish but it was a slog tbh. Still your whining is just a pile of BS. Now I wonder if CDPR is going to release a fix for this. I don’t want to play to far beyond my current save files in case I have to revert to get my stats back. In game menu is still laggy. Everytime I want to open my item box, it will lag for about 1 second, which is way too long. why I can’t buy Blood & Wine or Hearts of Stone to my ps4 ?? I have the money in My Wallet but when I click Buy then error code WC-40360-3 popup !! I cleared my Cart and tried many time but no way !! I also tried to buy the Expansion Pass and I got the same error !! DLC for Wither 3 Blood and Wine doesnt work. Ive got season pass and downloaded and install , but i have only HoS working. Can someone help with this? I read that others have same issue.